Find additional material to aid the study of our books. This Table presents an overview of the Human Constitution according to the teachings of H. P. Blavatsky. If you are not thoroughly familiar with it, it may be useful to print it out and keep it in your book to consult as you read the chapters. This PowerPoint presents the diagrams found throughout the book, here they are easily accessible for further study and sharing with a group. Our gratitude to Joe Hasiewicz for developing this visual aid. Click here for PowerPoint of Diagrams. Here you will find all the quotes used in the book, listed chapter by chapter with only some opening commentary for context. We have put this together in hopes you will find inspiration in diving deeper in the scope of HPB’s writings and those of her Teachers, Mahatma K.H. and Morya. Below you will find supplemental material presented to help you and your group in the study of Evolution of the Higher Consciousness. We have started here with the “Preface and Introduction,” where we will explore the Aims of the Book, its Plan, and some helpful hints in the Study of Esoteric Philosophy. Click on the underlined links to view and download these resources. 1. Video – Here we explain the rationale for Blavatsky’s frequently non-systematic style of writing and the basis for a meditative study of her teachings. We will continue to develop material for the other chapters of the book. Please check back on the website regularly. Notifications will also be on our Facebook page. Please feel free to contact us with your questions and comments: info@fohatproductions.com. There exists in nature a triple evolutionary scheme—the formation of three separate schemes of evolution, which in our system is inextricably interwoven and interblended at every point. These are the Monadic (or spiritual), the Intellectual, and the Physical evolutions. 1. Video – In this video, Pablo introduces us to HPB’s triple evolutionary scheme. 2. Study Guide for Chapter 1 – View on Evolution. Ātman, the “higher self,” is neither your spirit nor mine, but like sunlight shines on all. It is the universally diffused “divine Principle,” and is inseparable from its one and absolute meta-spirit, as the sunbeam is inseparable from sunlight. 2. Study Guide for Chapter 2 – Atman: the Higher Self. Video link … coming soon. 2. Study Guide for Chapter 3 – The Monad. 1. 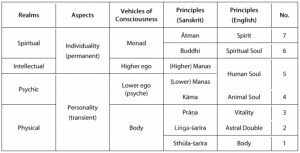 Study Guide for Chapter 4 – Manas: The Ego. As we have seen, in order to gather experience on the physical plane, the higher ego emanates a manasic ray to animate the body. As a consequence, its expression becomes greatly limited. In this “descent,” however, there is something else that happens – the Ray becomes entangled with the kāmic Principle, forming what is known in Theosophical literature as “kāma-manas“. 1. Study Guide for Chapter 5 – Kāma: The Animal Soul. The presence of the antahkarana helps the personality by providing a means for spiritual influence from the higher nature. The communication, however, goes both ways. The antahkarana is not only the source of “all good and noble aspirations” expressing through the lower nature, but is also the bridge to transfer any valuable personal experience to the higher ego. 1. Study Guide for Chapter 6 – Communication with the Higher. The Egos, who as divine beings, in order to become one with the whole, need to purify themselves. For this, they must experience the differentiated universe on two levels—as a spiritual Individuality and as a physical personality. 1. Study Guide for Chapter 7 – Evolution of the Higher Ego. Blavatsky explains that during life there can be partial union or “commingling” of the fifth [manasic] and sixth [buddhic] Principles. This state is called manas taijasa. The evolution of the spiritual ego is greatly hastened by the aspirant’s efforts to stimulate this state not only in meditation but also in his or her daily life. 1. Study Guide for Chapter 8 – The State of Manas Taijasa. 1. Study Guide for Chapter 9 – States of Consciousness. 1. Study Guide for Chapter 10 – The Thought Producer. In this last chapter, we will explore part of the Mme. Blavatsky’s Diagram of Meditation as our source for meditation, which begins by prescribing the cultivation of an awareness of being in all space and time. “First conceive of UNITY by expansion in space and infinite in time (either with or without self-identification). . . . Note: The conception [to be formed is] “I am all space and time.” Beyond that . . . (it cannot be said). . . .
1. Study Guide for Chapter 11 – The Sense of Space. Stepping Above Limitations … coming soon! This is the last chapter, we thank you for your patience as we have developed these Companion Guides for an introduction and as a complement to the study of the book. We hope they have been helpful. Please feel free to contact us with any questions and comments: info@fohatproductions.com. Follow us on Facebook page.